Your last chance to buy $6 tickets is tomorrow morning (Friday). After that, they will be available at the door for $8 per person. Our first ever spring dance is here, Neon Nights 80’s Glow Party! 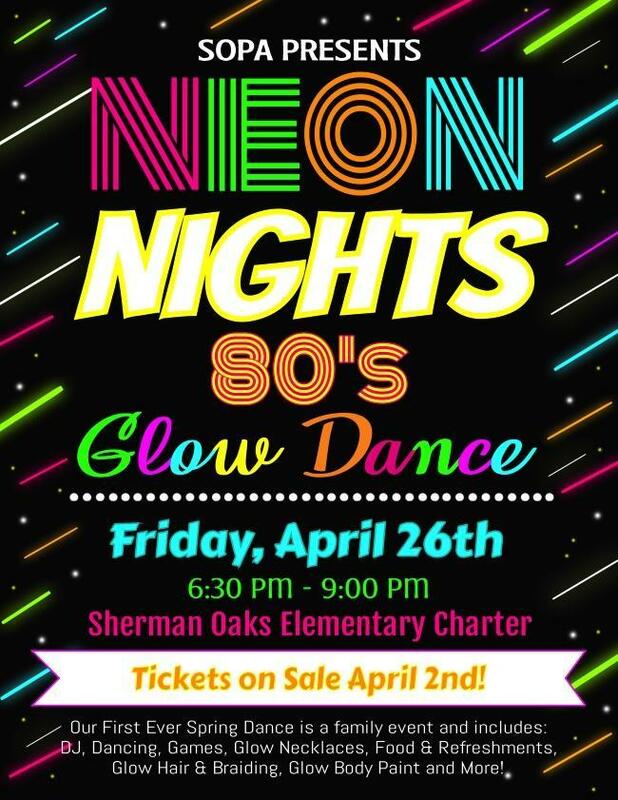 Neon Nights will take place at SOEC on Friday, April 26th from 6:30pm – 9:00pm. This community event is open to all - students, family, and friends are all welcome! This incredible event will include DJ, dancing and games as well as tons of fun extras like a glow hair booth, glow body paint, glow slime station, and glow toys. Best of all, no need to worry about dinner. There will be lots of great options for purchase including CPK, Frida Mexican, Subway, and Kona Ice. So grab some fabulous 80’s attire, and get ready to dance the night away.